Beginning April 15, SUNY New Paltz students can choose from hundreds of course sections in all five academic schools that will be offered during Summer Session 2019. Follow this link for more information about Summer Session 2019 courses and registration. Summer Session is one of the best options available to students looking to explore new interests, get ahead in their majors, gain valuable fieldwork experience, fulfill General Education requirements and study alongside faculty mentors. This year’s offerings include a number of unique for-credit experiences including internship and summer study abroad opportunities. 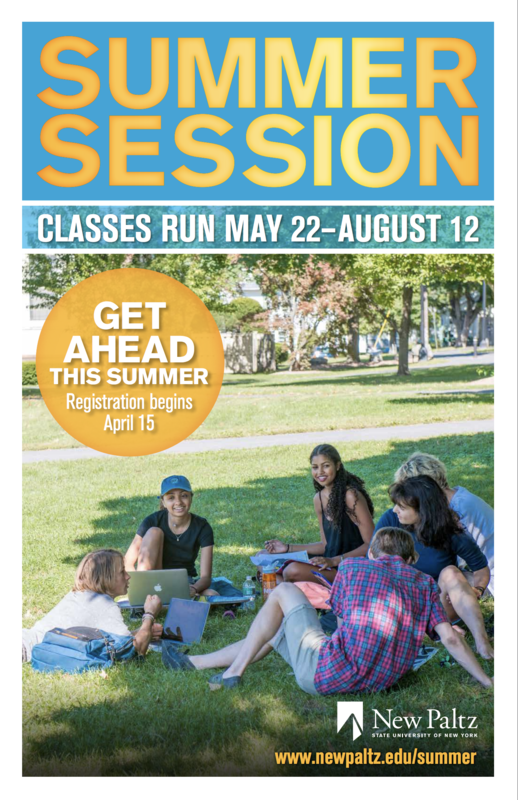 Classes run from May 22 – Aug. 12, with 10 different term options, so you can enroll over the course of the full summer or for as little as two weeks, depending on your schedule needs. See the Schedule of Classes online to learn more. There is a 12-credit limit for summer registration. Students are encouraged to consult with an academic advisor to ensure that courses will satisfy requirements and help advance toward degree completion.